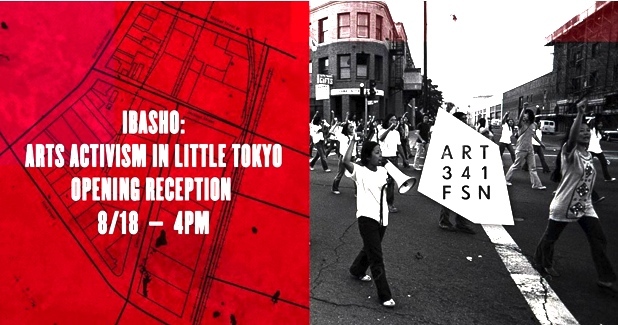 “Ibasho: Arts Activism in Little Tokyo” is on view through Sept. 29 at ART @ FSN, 341 E. First St. in Little Tokyo (formerly Matsumura Gift Shop). An opening reception will be held on Saturday, Aug. 18, from 4 to 7 p.m.
“Ibasho” is an exhibition that “shows the long history and contemporary practice of arts-based activism centered in L.A.’s Little Tokyo, reminding us of the role that creativity and culture play in advocating for our right to the city,” organizers said. Exhibited materials demonstrate issues ranging from the role of theater in agitating for Asian American representation in media to the visual strategies used in ongoing fights over gentrification and urban development. Organized as an archive of archives, “Ibasho” includes work from Visual Communications’ extensive photo archive, clippings from the radical publication Gidra, sound and video from East West Players and Tuesday Night Cafe, treasures from Takachizu, and more. Curated by Jonathan Crisman and designed by Yuji Sakuma for Sustainable Little Tokyo.